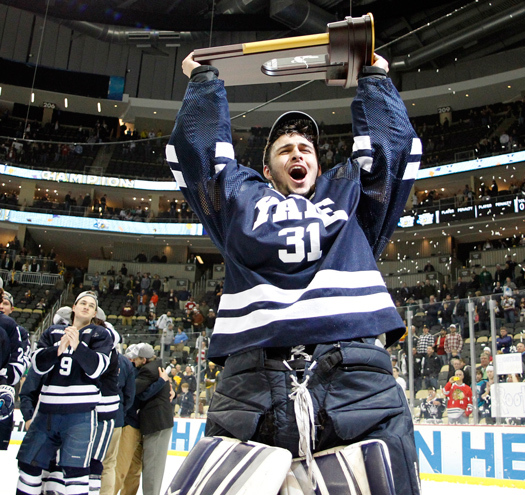 Over the past four years, 33 different programs have made it to the NCAA tournament, and for the fourth time in the past five years there has been a first-time champion, including Yale University in 2013. Queen’s classic ballad “We Are the Champions” is the traditional music blasted inside the locker room of the NCAA Frozen Four champions. Although in recent years, Foreigner’s catchy number “Feels Like the First Time” might be a more appropriate soundtrack when the national championship trophy is hoisted at center ice. When Providence College skated off the ice at Boston’s TD Garden in April, it marked the fourth time in the past five years that the Frozen Four has been won by a first-time champion. The Friars joined Minnesota Duluth (2011), Yale (2013) and Union (2014) among programs having to map out their initial ticker tape parade route. In this new world of college hockey parity, it’s now been more than a decade since a team has repeated as champions – Denver won back-to-back crowns in 2004 and 2005 – and when you’re looking to pick a winner among the Frozen Four field, the recent odds say you should look for a lack of tournament experience. “A four-year player gets to develop with a good coaching staff over a longer period, and build more team unity, which can be a big boost to on-ice success,” said Yale coach Keith Allain. The hard numbers show a college game where anyone – not just the “BCS” programs like Michigan, Minnesota, North Dakota, Boston College, etc. – has a real shot at getting into the NCAA tourney, and at winning four games there. In the past seven years, there have been 28 spots up for grabs in the Frozen Four and 20 different programs have filled them. Opinions vary on the source of this recent parity, but College Hockey Inc. executive director Mike Snee sees a case that any math major could figure out pretty easily. More high-level players are available to college recruiters, while the number of players per team (roughly 25) and the number of colleges fielding D-I hockey teams (59) has stayed the same. “The competitiveness in college hockey today is directly related to the significant increase in Americans playing at a very high level,” Snee said. Another theory notes that a player fast-tracked for a pro hockey career may stay on campus for a year or two before heading to the big leagues. In contrast, the less-heralded college programs have to find more “hidden gems,” which means rosters with more four-year players who may have started college hockey after two or three years of Juniors. So one team’s best player is a 19-year-old sophomore, while another team’s star is a 24-year-old senior. That additional maturity makes a huge on-ice difference.